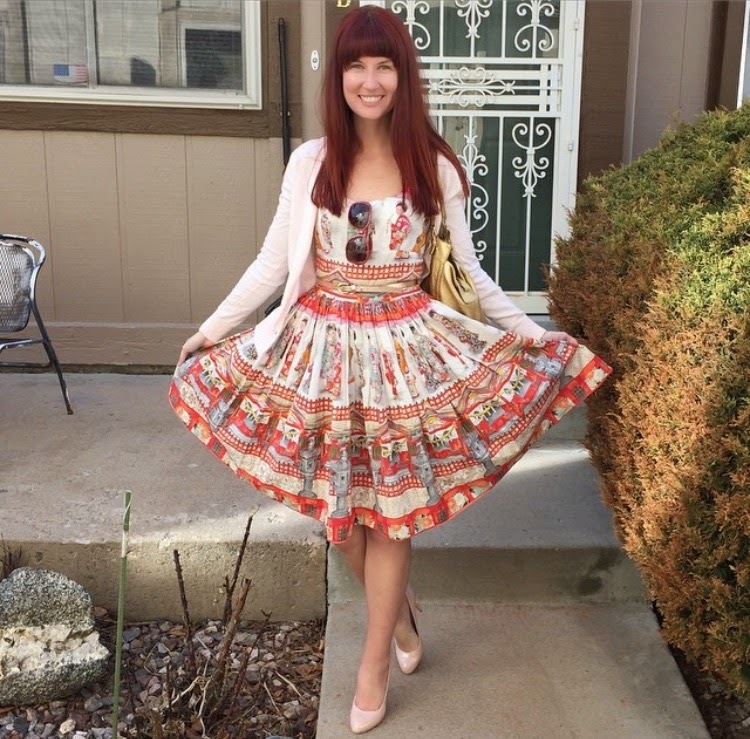 As you saw with my ModCloth round-up, I'm doing things a little differently in that I'm rounding up brands when I hit nine outfits (or however many items I own in a brand) and then discussing the outfits, thoughts, and stylings on here. I'm a little delayed in this series and almost have another 9 Bernie outfits set to go, but here was my batch of Bernie dresses from 2015! I spent the first day in 2015 with my drunken elephant print from Bernie Dexter! It seemed fitting because they're drinking champagne, but also because elephants are supposed to bring good luck (according to several cultures). So why not start 2015 with this dress?! Fact: the mountains are cold. Denver is not (always). This is from a 60+ degree day in January. Colorado has 300 days of sunshine, y'all! It's not always a blizzard, regardless of what Hollywood will tell ya! 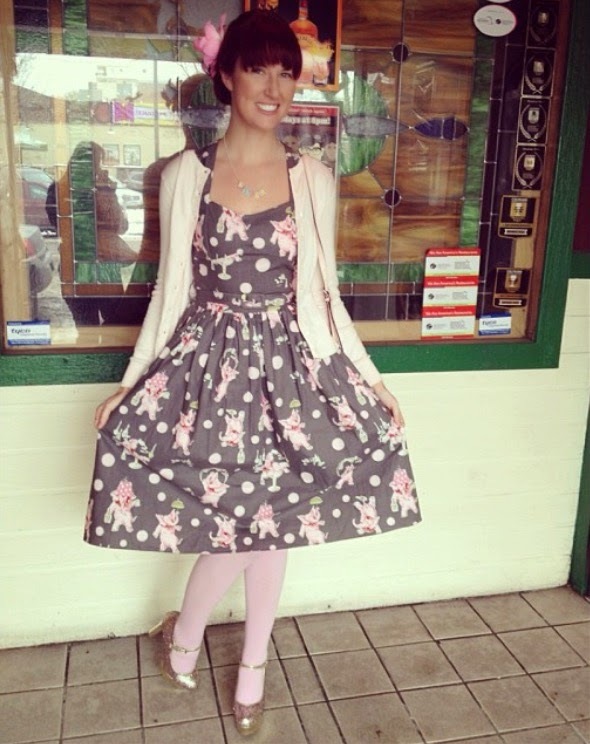 This dress I got via eBay just prior to the new year and was stoked at have an (appropriate) chance to wear it! I wanted to pair it with my hot pink cardigan but couldn't find it-though I ended up not needing it! When you think baseball, you think warm weather! Sadly this was on a more brisk and windy day, but I made do! My friend Kelsey is kind of connected with the Colorado Rockies and knowing that I'm a big fan she invited me to a pre-season event where we even got to meet some of the Rockies! I didn't get any pictures with them, but I did get a photo with this Mickey Mouse in a Rockies uniform...which is likely way more appropriate for the vintage loving community than the players! Naturally I picked one of my favorite Bernie dresses to wear to this event because it's probably the best purple dress I own! I usually wear these pink heels with this dress and tried to change that by trying both of my purple heels with it (lavender pumps and dark purple Mary Janes) but they didn't work as well as I thought, especially with my accessories. I own one Bernie Dexter skirt, but all of the rest of my BD pieces are dresses...until this piece! I got this body suit directly from her eBay store. I'm an XS in her dresses, but since I'm a small in her skirts I decided to go for the small with her body suit and I think I made the right choice. It's a little low setting for my taste, but other than that it fits perfectly! And I'm mega happy to have a gold top that's straight up gold (so many "gold" tops are pewter, or champagne, and beige with highlights, right?). Naturally I had to pair this with my vintage skirt with gold in it! I heart my dog dress so much! I actually wasn't wearing the cardigan 90% of the day because it was one of those 75 degree days in January that Colorado got, but given that the weather was dropping for the evening when I took this photo and I liked how the cardigan went with the heels I decided to wear it for the photograph. This is such a perfect warm weather dress because the material is slightly lighter than some of her other dresses so it feels more summer-y. I love this one so much. I haven't worn it too much because I have to get it altered (the Chelsea dresses run big for me and since I got it for next to nothing on eBay it's worth it). But for the luke warm days we were having in February it was the perfect dress to pair with a cardigan over the bust/arm pit area to hide that it's big. 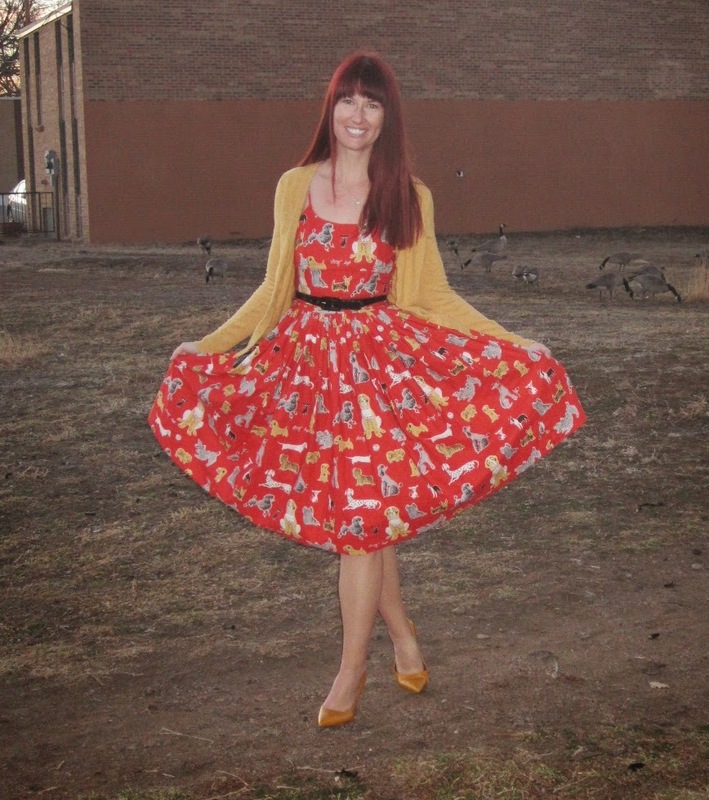 I wrote about this dress HERE! I think this is one of Bernie's more unique dresses. 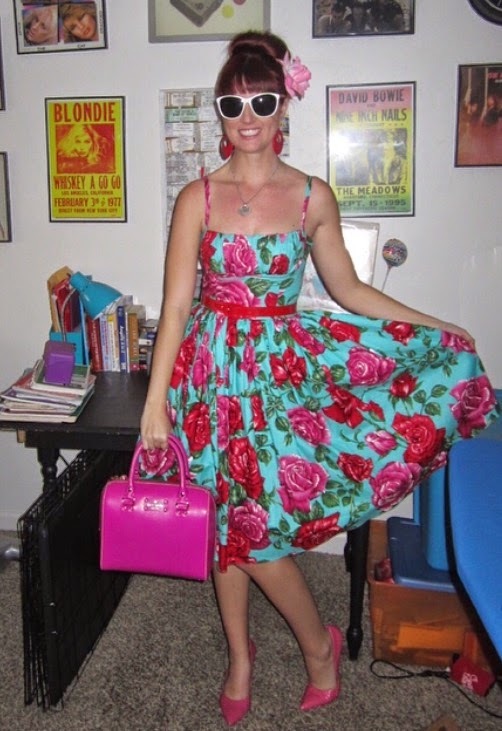 Obviously the print isn't as loud or novel as some of her others, but I feel like this dress isn't just a pinup dress as it's reminiscent of so many time eras from the 20th century of classic ladylike fashion. I feel like my mom had a similar dress (shape and pattern) in the 80s. 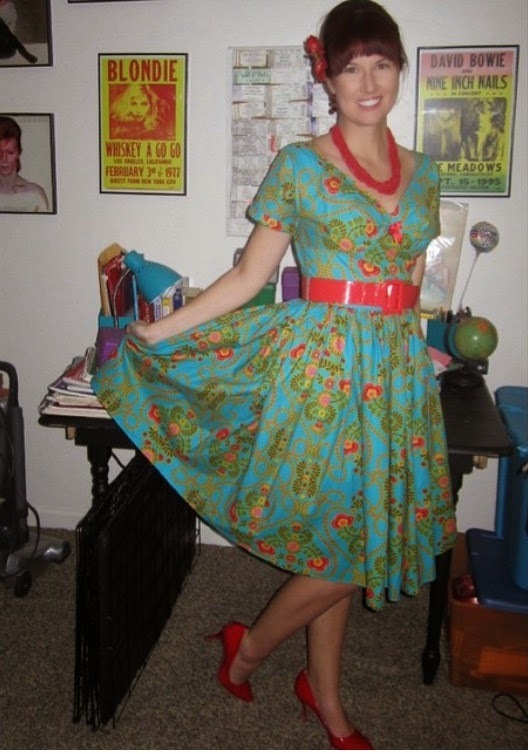 I feel like I could style it in a bohemian way as well a pinup way. I almost didn't get this one-several times-because I feel it's not exactly my usual style. But I REALLY love it and am so glad I finally tracked it down on eBay! 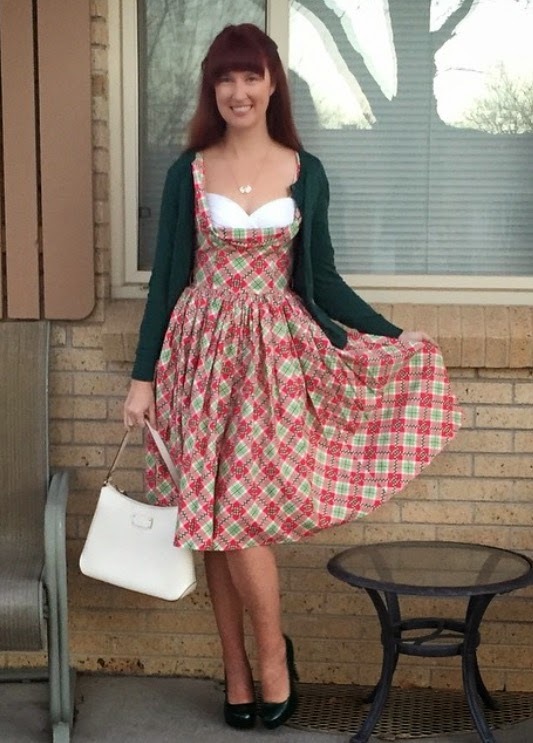 I feel like this dress gets super popular in December because of the red and green motif. When I first saw it I immediately saw it as a February dress or even a fall dress! Then again, I don't celebrate Christmas so that's probably why my brain immediately didn't think that! Regardless, I was glad to wear this dress in February, and I was super excited to pair it with my forest green shoes and cardigan. You have such a great Bernie colelction, girl! (I know this is only part of it, ha.) You look so great in her clothing. 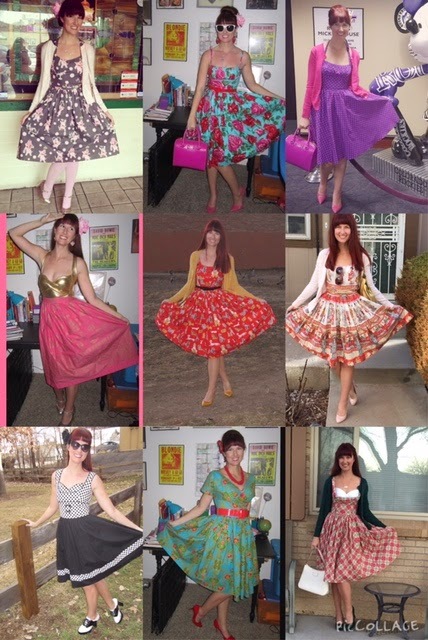 I am also very obsessed with her dresses and skirts! So glald my collection has grown in a lot in the past few months.